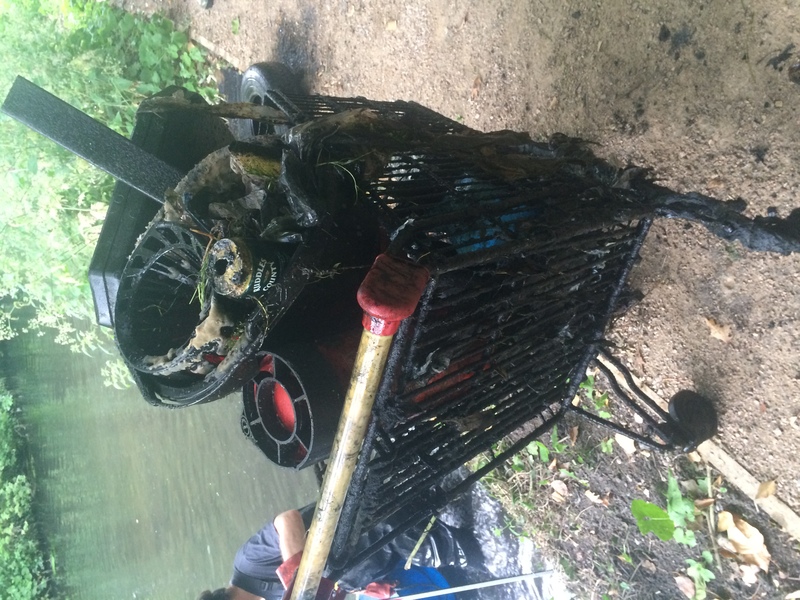 The one where we cooked in our waders….. 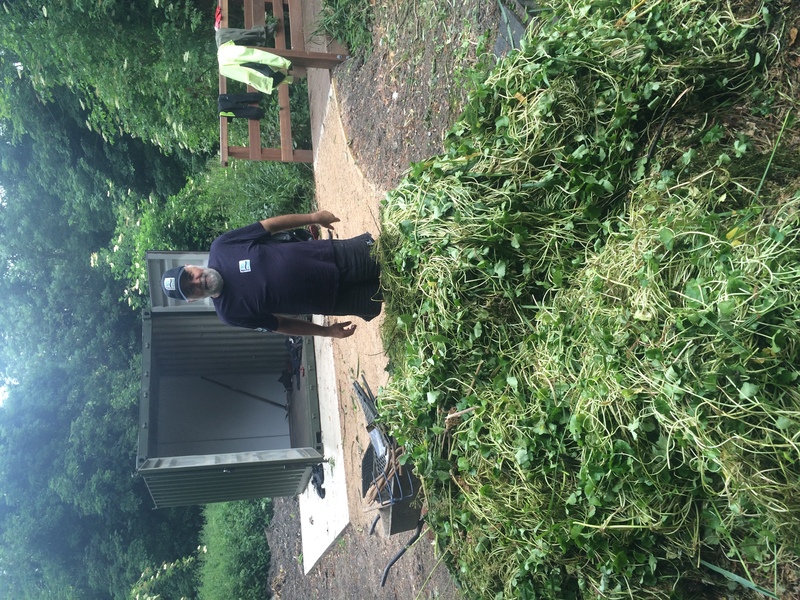 This August was the first of our Capital Cleanups, kindly funded by the Mayor of London Capital Cleanup fund, held in Beddington Park on a very, very sunny and hot day. Not ideal weather for waders or wellies. Rose was kind enough to help me load the van for this event, and I was thankful to have her with me as I turned up to site to find a car boot sale blocking the road. Luckily we squeezed the van through and set up in our usual spot ready for everyone to arrive. 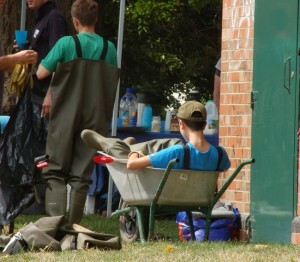 This month we divided into three teams: the wading team; their wader support and balsam bashers. Theo had found several patches of Himalayan balsam in the park which he was keen to get on top of. 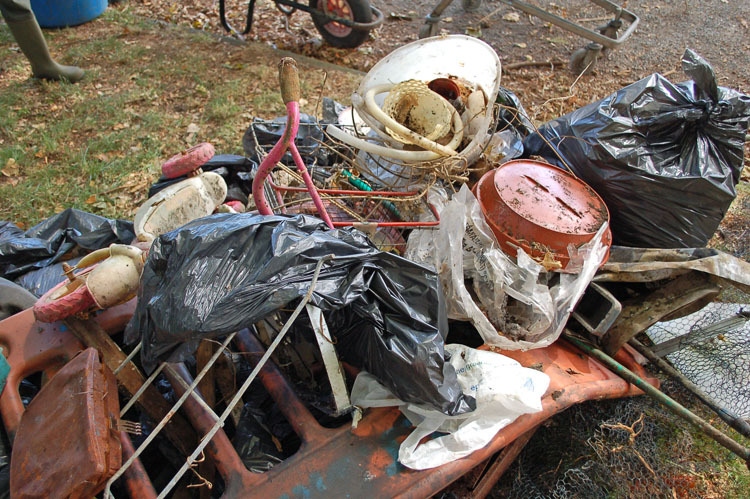 Soon more and more rubbish was coming out: tyres, pitch fork, metal fencing, large pieces of wood. For a narrow stretch of the river, it didn’t disappoint. Behind the wading team, Theo and a couple of others were checking for individual Himalayan plants on the river bank to ensure we swept the whole park clean. 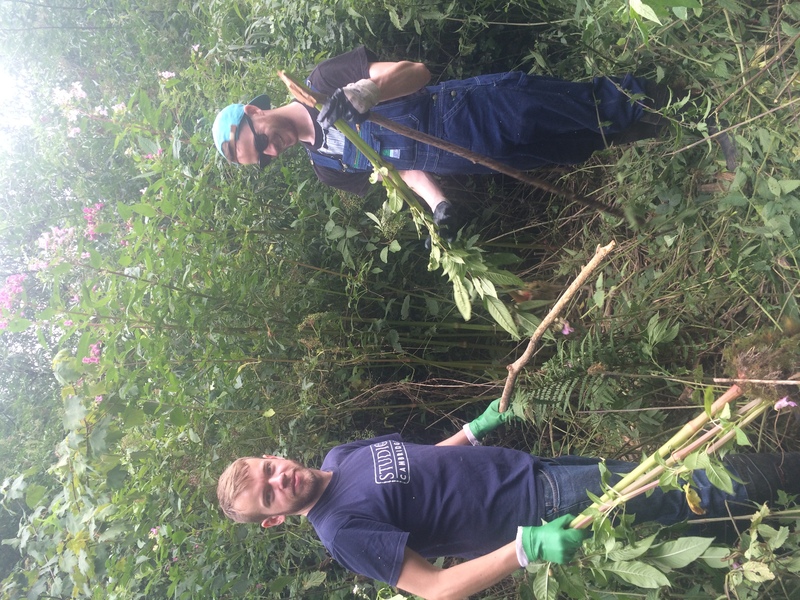 While this was going on, a brave team tackled a large infestation further into the park where the balsam was the height of trees and the stems were the thickest we’d ever seen them. A true balsam jungle amongst the nettles. By lunchtime we were all very hot and ready for a cool drink. Jackie had kindly made us some jam tarts and I had baked three chocolate cakes which I then packaged to look like they had in fact been purchased… it’s the small touches. After lunch we reluctantly put our waders and wellies back on and got back in the river. The wading team had cleared the river before lunchtime so after lunch we all focused on the balsam. With the bulk of it removed, we were looking for smaller plants in the undergrowth which we wanted to catch before they set seed for another year. It took a little while to get our eyes honed in, but sure enough there were plenty hiding in the nettle jungle. With Beddington Park cleared of balsam (for this year anyway) and rubbish we decided to finish a bit early to cool off. Thank you to all the volunteers who came along and tolerated the heat for our event! So what did we find? 1 pitch fork, 1 paint tub, 1 watercolour set, 1 scooter seat, 1 wooden chair, 1 hamster cage, 1 tyre, 2 buckets, 2 Asda trolleys, 3 set of tea china, 4 coconuts, 8 large pieces of wood, steel roofing, plenty of metal fencing, 25 bags of other junk and barrows and barrows of Himalayan balsam. Huge thanks to everyone who helped pack up van after the event and Rose for helping me load and unload; Jackie for catering for our volunteers; Rose for supervising the Event Tent; Chris, Wally, Theo & Dave for helping supervise everyone on the day and the Waste Management Team at Sutton Council for organising collection of all the rubbish the next day. Thank you to all our volunteers for coming: Charles, Chris, Daniel, Dave, David, Denis, Derek, Fred, George, Gillian, Graham, Helen, Hugo, Ian, James, Jamie, Joe, John, Karoline, Keith, Ken, Lisa, Lois, Louise, Mark, Mike, Neil, Per, Phil, Richard, Rob, Ruth, Sally Ann, Theo, Tom K, Victor and Wally. So what did I learn from this month’s cleanup? Sunshine and chest waders are not a great mix. 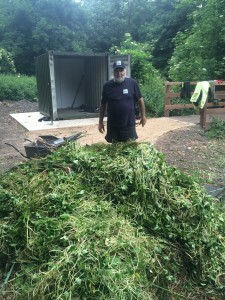 This entry was posted in Uncategorized and tagged Beddington, Cleanups, Education, Events, INNS, invasive species, Living Wandle Landscape Partnership, People, Spreading the Wandle Word, Volunteer, Wandle on August 24, 2015 by Polly. 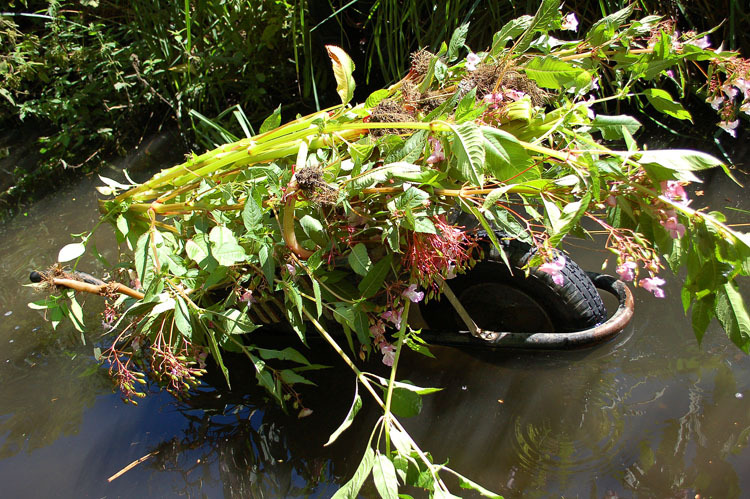 The Battle of Watermeads was fought between the Wandle Trust and two invasive plants which had been successfully invading the River Wandle for many years: Himalayan balsam and floating pennywort. Historians have pinpointed the start of this epic, ongoing war of attrition against the Wandle’s invasive non-native species as far back as June 2010 or earlier, and our latest campaign has certainly started with the recruitment of General Alan Martin. 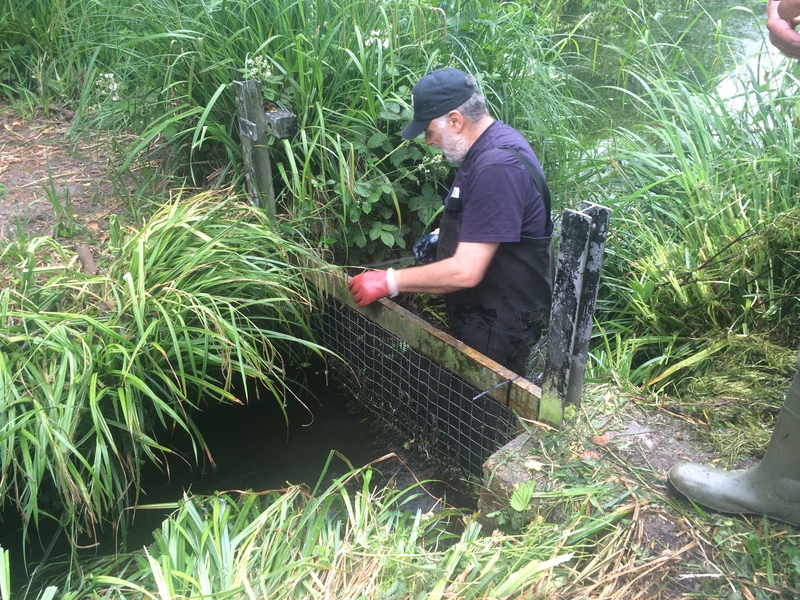 Alan joined the Wandle Trust movement in April 2015 to help coordinate a river wide action plan against plants and other invaders, and Himalayan balsam and floating pennywort have quickly become two of his most formidable opponents. 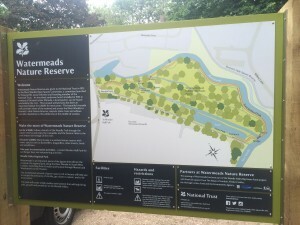 On Friday 31st July, two armies faced each other in Watermeads Nature Reserve. The Wandle Trust General, Alan Martin, had recruited 29 dedicated and loyal volunteers to his cause. Together they faced a terrifying scene and were horrendously outnumbered by the ranks of balsam and pennywort established throughout the reserve. But this did not deter them. The battle started at 11am. General Alan divided his ranks into two regiments, each to face one of the enemies alone. General Alan took charge of the floating pennywort regiment and took to the high seas of the Watermeads back water. Captain Joe bravely guided the vessel behind enemy lines to cut free rafts of pennywort, while the rest of the regiment waited on shore to haul in the catch with grapples and rakes. As the battle raged on, General Alan’s faithful sidekick, Pepper, kept watch on the troops and raised morale. At 4pm, both armies called a truce and re-grouped ready to fight another day. 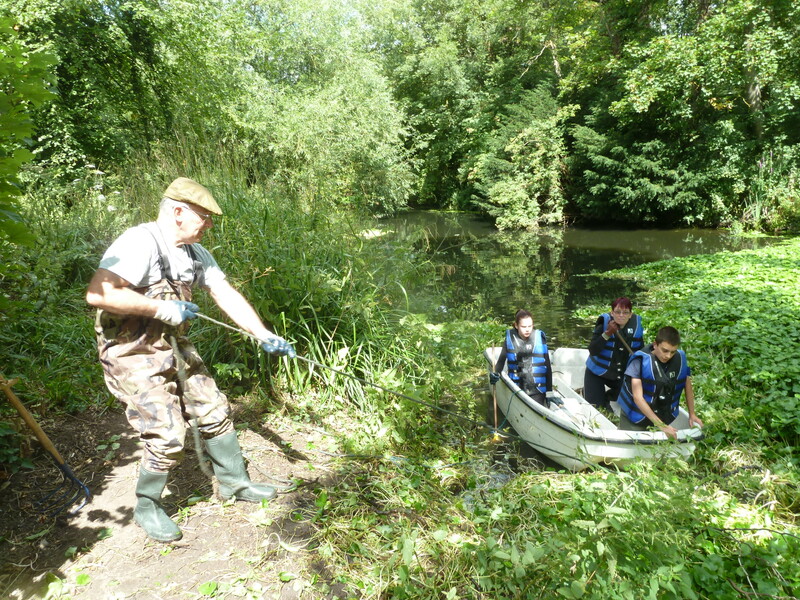 The Wandle Trust Army had come out on top with no casualties save for a few nettle stings. 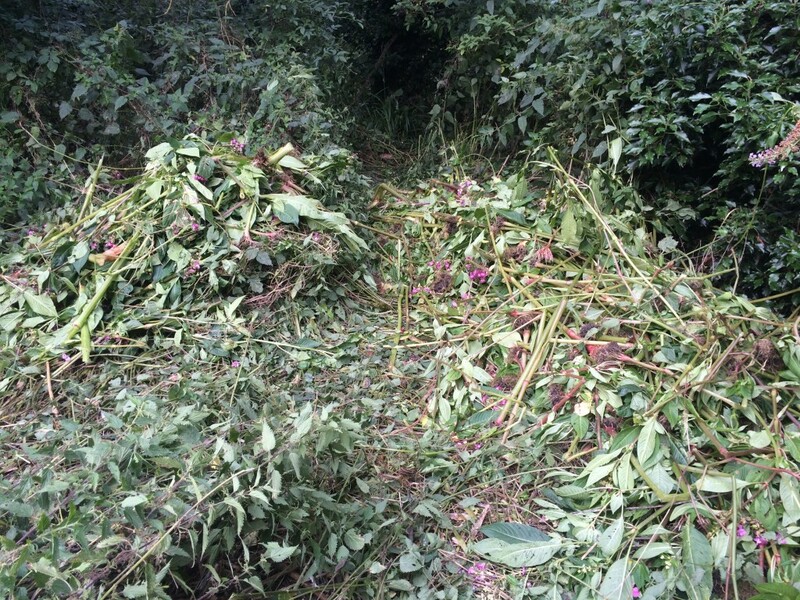 For the invasive plants, it was a tough defeat. Pennywort and balsam casualties were everywhere. 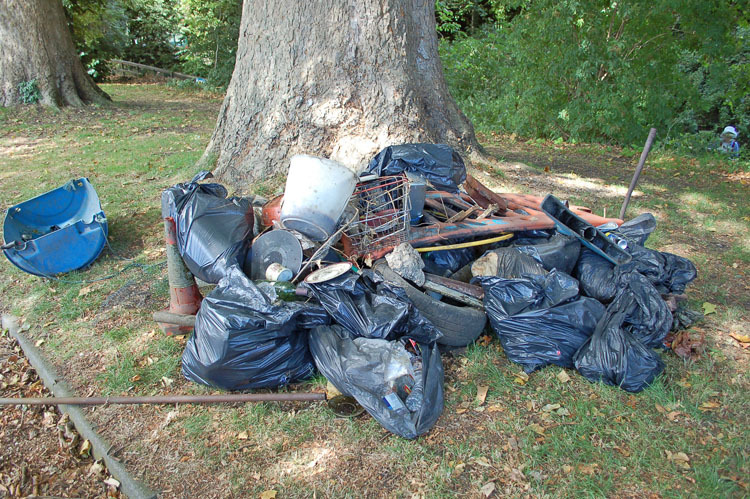 All that was left was for the Wandle Trust Army to clean up and make sure they weren’t spreading the enemy further by their equipment. The answer? Power hose. A prospect all too exciting for Pepper. 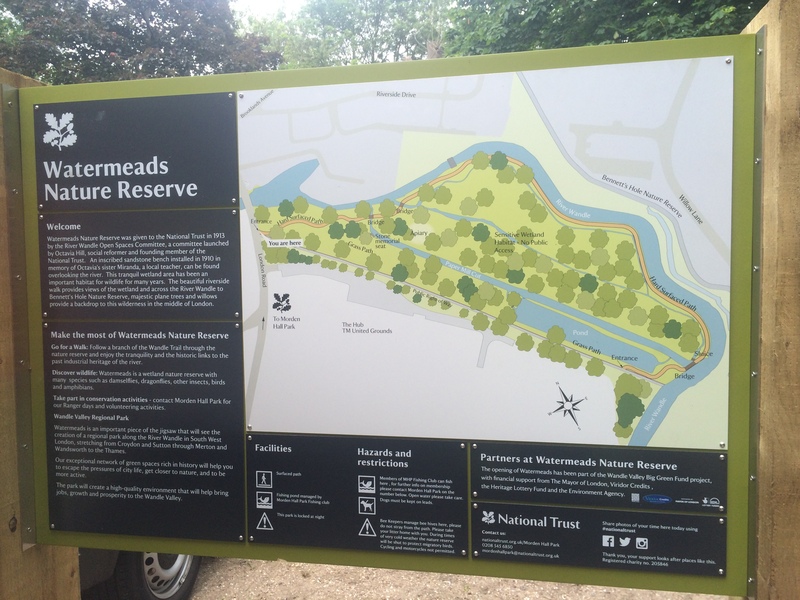 Join us for the Battle for Watermeads II on Friday 21st August, 11am. 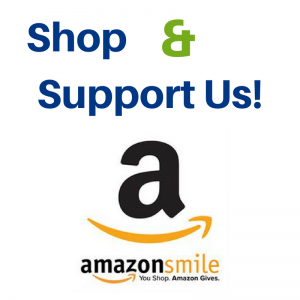 Campaign plans can be found here. This battle has been key to General Alan’s plan for the whole river – a campaign to eradicate invasive non-native species from the river to allow the return of native flora and fauna. A campaign which is part of the Living Wandle Landscape Partnership. You can join General Alan’s crusade and sign up as a River Ranger to hunt down and monitor other invasive plants along the river. This event was supported by the National Lottery’s Heritage Lottery Funded through the Living Wandle Landscape Partnership. 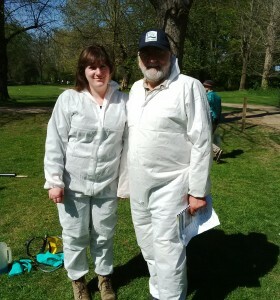 This entry was posted in Uncategorized and tagged Events, HLF, INNS, invasive species, Living Wandle Landscape Partnership, People, Spreading the Wandle Word, Volunteer, Wandle, Wandle Catchment Plan on August 13, 2015 by Polly. Will you join our River Rangers Team and help hunt down invasive non-native species on the Wandle? 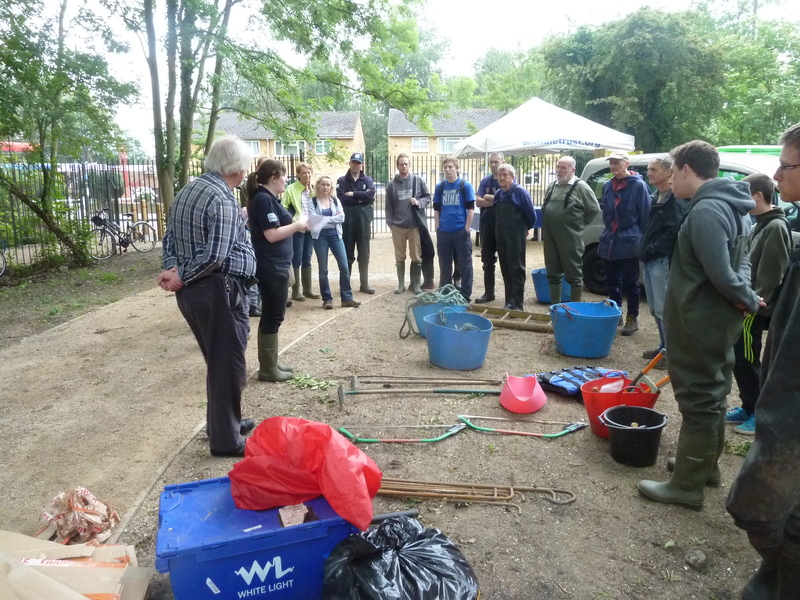 We are looking for enthusiastic volunteers to join our River Rangers team and help us monitor invasive species on the River Wandle from its source to the Thames. 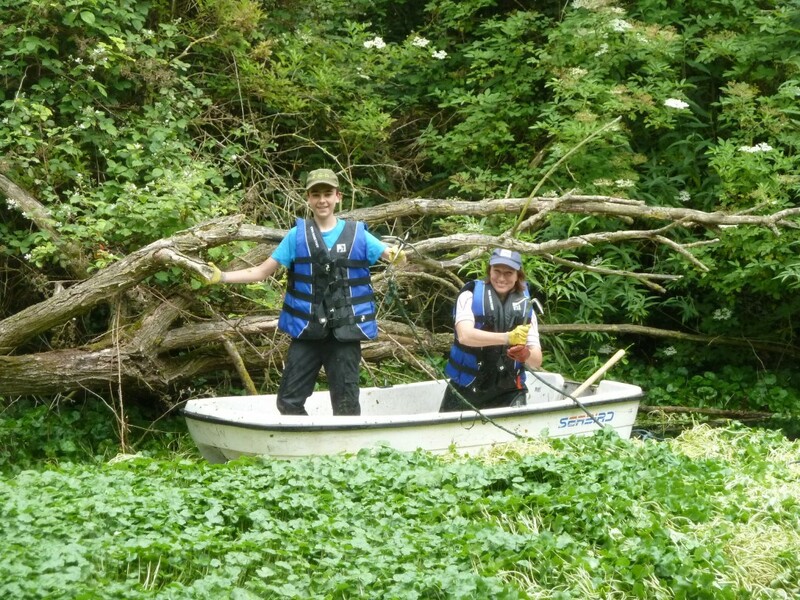 Our team of trained recorders will survey the entire length of the Wandle three times a year, building up a picture of where the invasive species are and how well our management efforts are working in controlling them. Training for the team will take place this August on the 19th or 20th – date and venue to be confirmed soon. What makes a biological record? Following training, our River Rangers will be unleashed on the Wande three times a year to map invasive species through the different growing seasons. Data will be uploaded online to LISI – London Invasive Species Initiative. The first River Ranger day will be Sunday 27th September 2015. This project will form a valuable baseline monitoring system for our efforts in the eradication of these invasive species. Next year, a Hit Squad will be trained up in the management of INNS and will work alongside our River Rangers to manage and control the species they record. This project is supported by the National Lottery’s Heritage Lottery Fund as part of the Living Wandle Landscape Partnership. 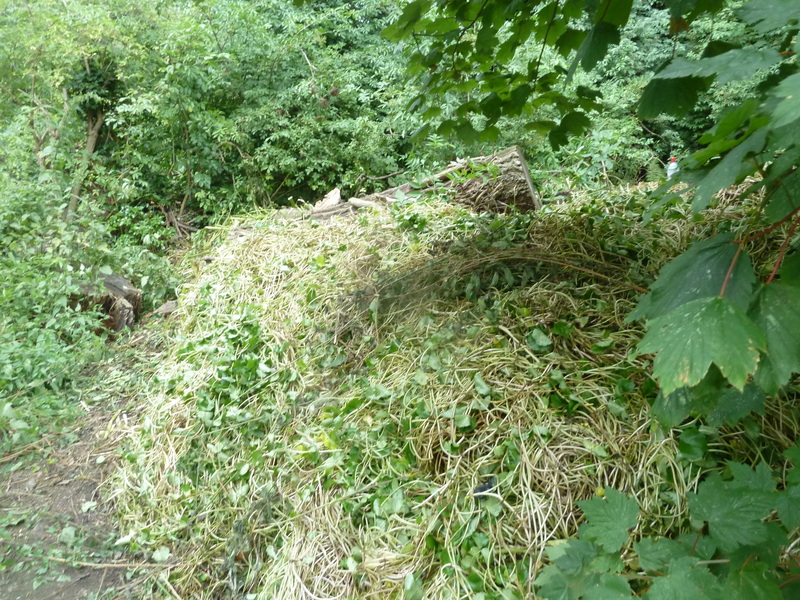 This entry was posted in Wandle Catchment Plan and tagged Events, floating pennywort, Himalayan balsam, HLF, INNS, invasive species, Japanese knotweed, Living Wandle Landscape Partnership, Monitoring, People, River Rangers, Spreading the Wandle Word, Volunteer, Wandle, Wandle Catchment Plan on July 27, 2015 by Polly. 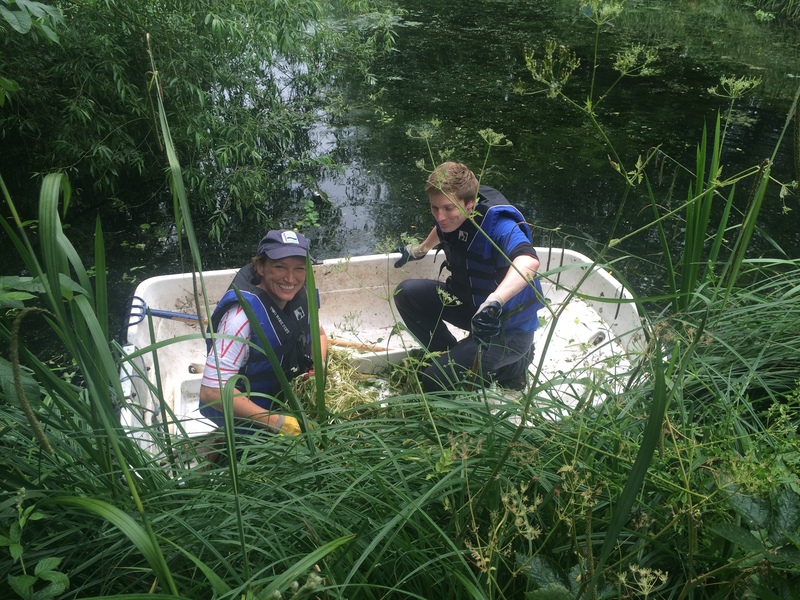 I had been very excited about this cleanup for a while as it was being held in the newly opened Watermeads Nature Reserve near Poulter Park – a truly beautiful site for a Wandle Trust event! The event was funded through the National Lottery’s Heritage Lottery Fund as part of the Living Wandle Landscape Partnership. To start the event off, we introduced our new Invasive Species Officer – Alan Martin. Alan is working to coordinate the control of invasive species along the entire Wandle corridor with the help of other organisations, local landowners and volunteers. Team 1: The litter pickers! 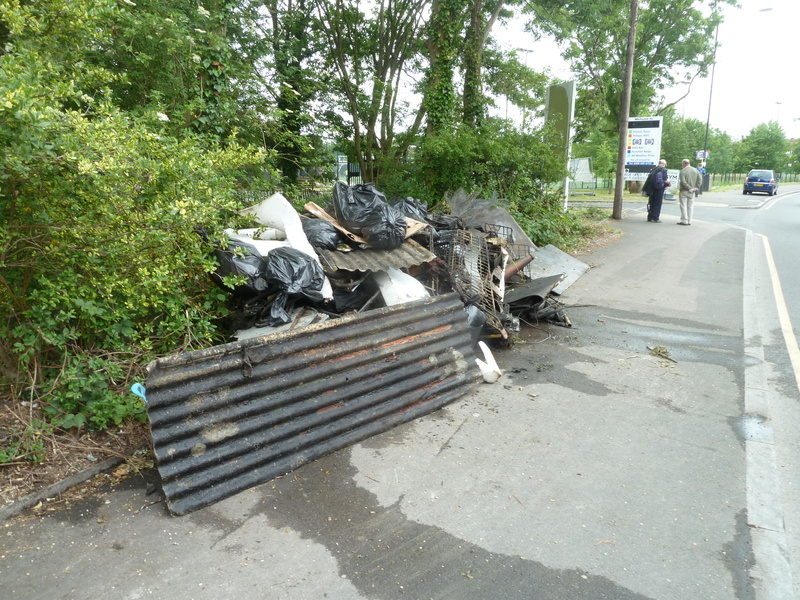 Since Watermeads was so newly opened to the public, the litter pickers weren’t sure how much general rubbish they would find, but as always they tracked some down! 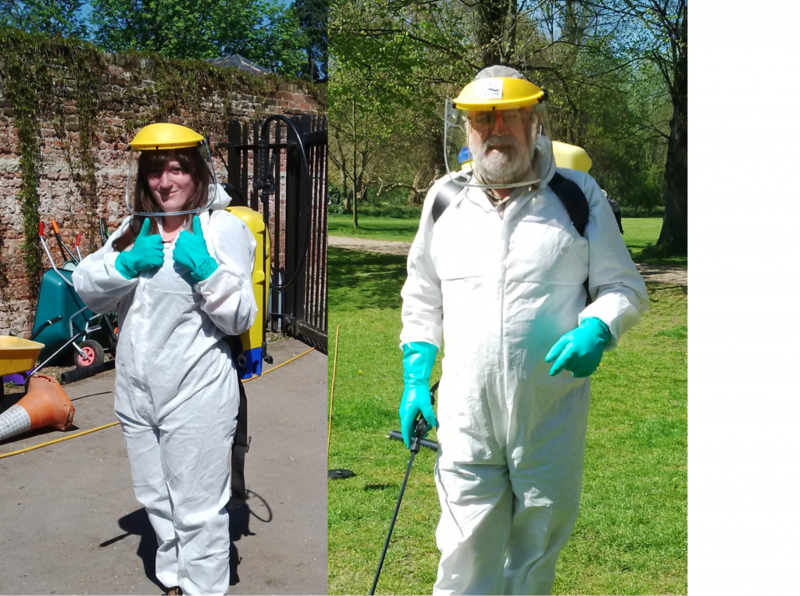 Using our newly purchased litter pickers and our new bag hoops provided by the Capital Cleanup fund, they dispersed into Watermeads and returned with bags of litter! 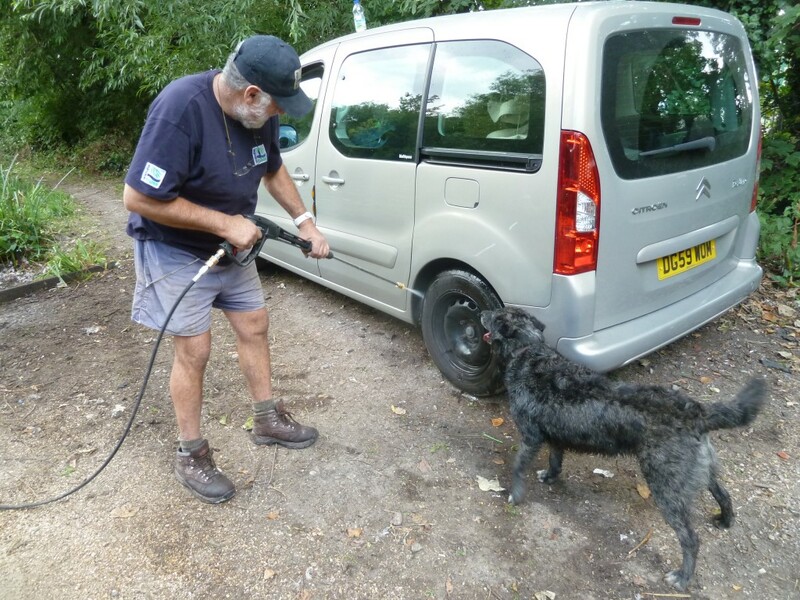 Again armed with new litter pickers, our wading team headed to the far end of the reserve to hop in the Wandle and start hunting down rubbish. Although shallow in the reserve, the river bed was very silty so the waders made slow progress as they moved upstream. 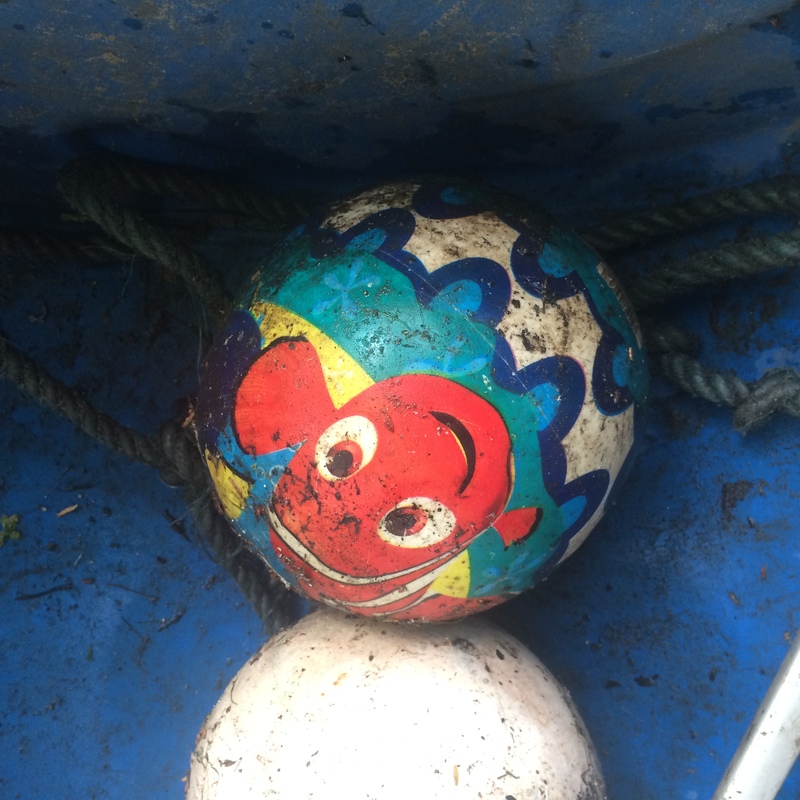 With such high levels of silt, finding rubbish was a challenge – but that didn’t stop them! 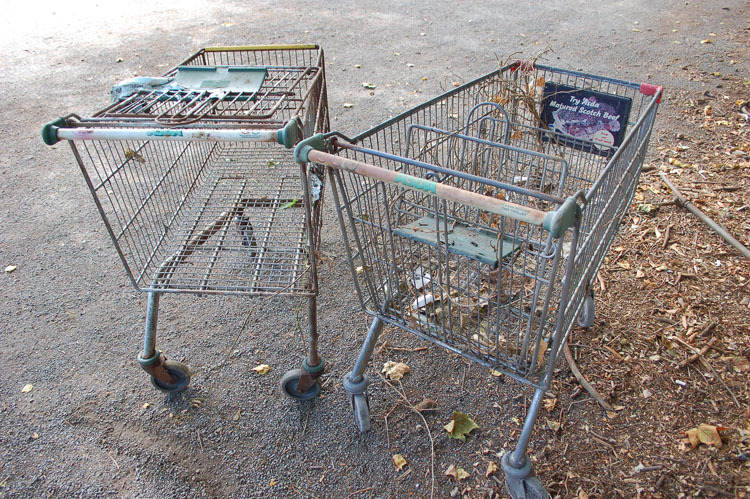 Using their feet they discovered two trolleys, rolls of carpet and several traffic cones and tyres, all before coffee time. 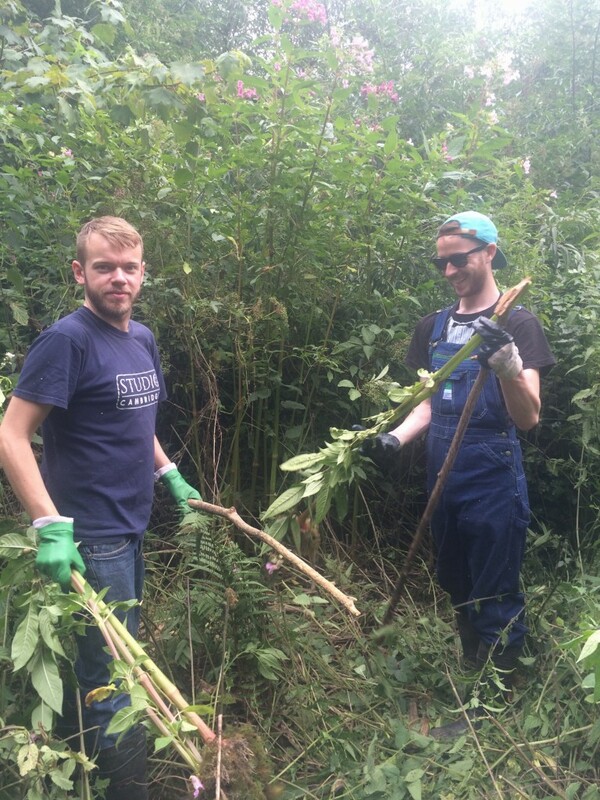 The Watermeads Nature Reserve was full of Himalayan balsam so Theo led a team to track down each plant and pull it out, roots and all. 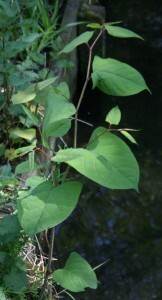 They first tackled balsam along the edge of the river and paths – to ensure these plants wouldn’t seed and spread further downstream. After this, the team bravely ventured into the undergrowth of nettles and brambles to find forests of balsam standing well above their heads. 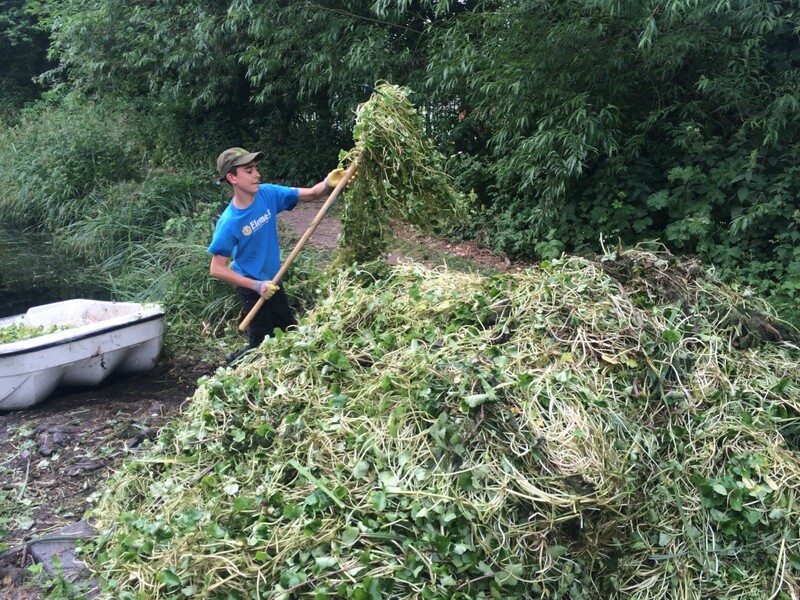 Volunteers used grappling hooks and rakes to pull in pennywort from the banks. 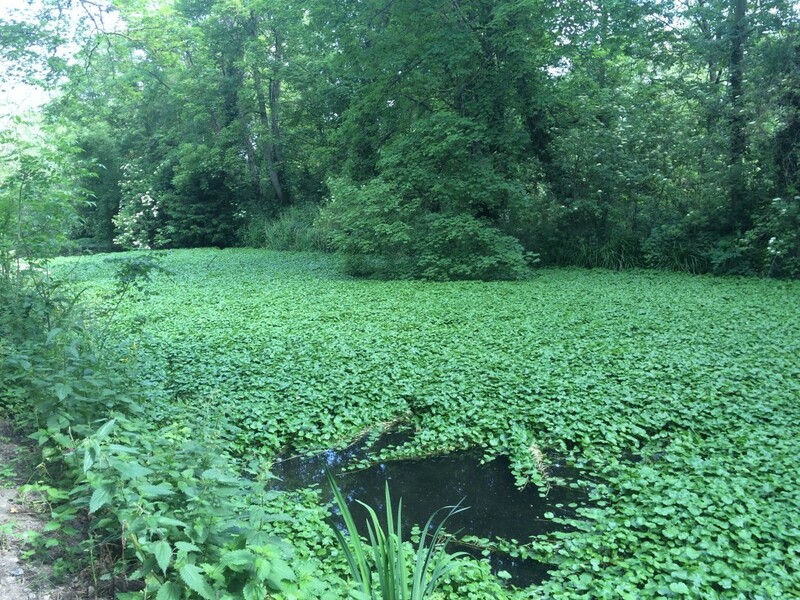 It was a strange sight to see – volunteers lassoing hooks across the pond in the hope of snagging a large raft of pennywort. They quickly cleared one side of the bank and were in need of support to reach the other side. Two lucky volunteers stepped up and got into a boat. Using very, very small paddles, they freed pennywort from the other side and used grappling hooks to tow the rafts back to the bank. A true example of team work. Meanwhile, Alan wanted to be sure the pennywort wasn’t spreading any further downstream. With the help of Dave, they created a barrier at the end of the pond to catch any straying bits of pennywort, containing the invasive in one place. It was a very busy day but we achieved so much in just four hours! So a BIG thank you to all our volunteers who came and we look forward to seeing you at the next one on July 12th in Hackbridge – details to follow soon! So what did we find? 1 baseball bat, 1 old hairdryer, 1 fire extinguisher, 1 Hindu statue, 1 shovel head, 2 carpets, 4 footballs (including 1 Finding Nemo football, so glad we found him), 3 traffic cones, 3 trolleys, 5 plastic guttering poles, 11 tyres, piles of wood and metal sheets, many bags of other miscellaneous rubbish, piles and piles of Himalayan balsam and even larger piles of floating pennywort! Huge thanks to everyone who helped pack up van after the event, Sally and Ann for catering for our volunteers (carrot cake and cheese scones were delicious! ), Jackie for supervising the Event Tent, Theo, Sally and Alan for helping supervise everyone on the day, National Trust for letting us loose in Watermeads Nature Reserve and the Waste Management Team at Sutton Council for organising collection of all the rubbish the next day. Thank you to all our volunteers for coming: Aaron, AJ, Amarapuspa, Ann, Barry, Carol, Charles, Daniel B, Dave J, Dave W, David, Dennis, Derek, Ed, Felix, Harrison, Henry, Ian, Jackie, James W, Jane, Joe, John L, John N, Kas, Keith S, Marta, Marion, Mark, Nicholas, Nick H, Nick W, Per, Richard, Rose, Sally, Sue, Tara, Theo and Thomas C.
So what did I learn from this month’s cleanup? 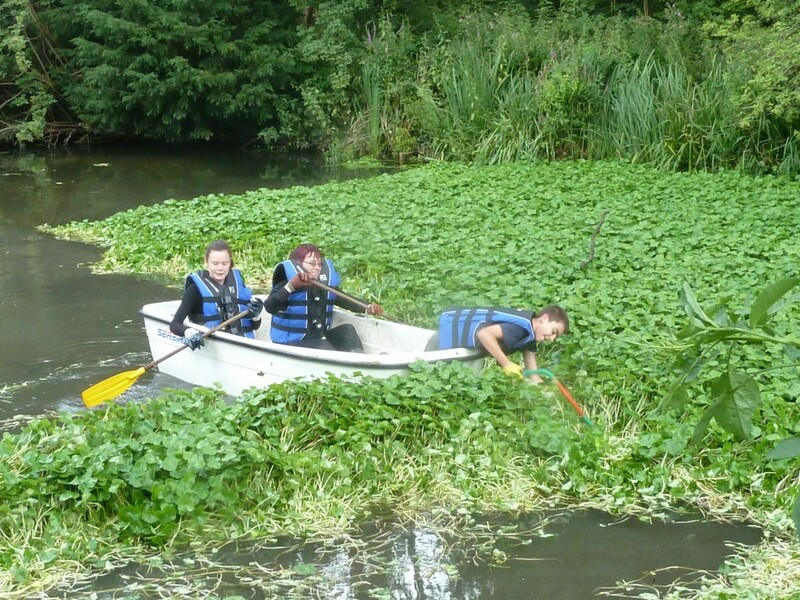 That you have to be very creative when tackling pennywort in a pond too deep to wade! 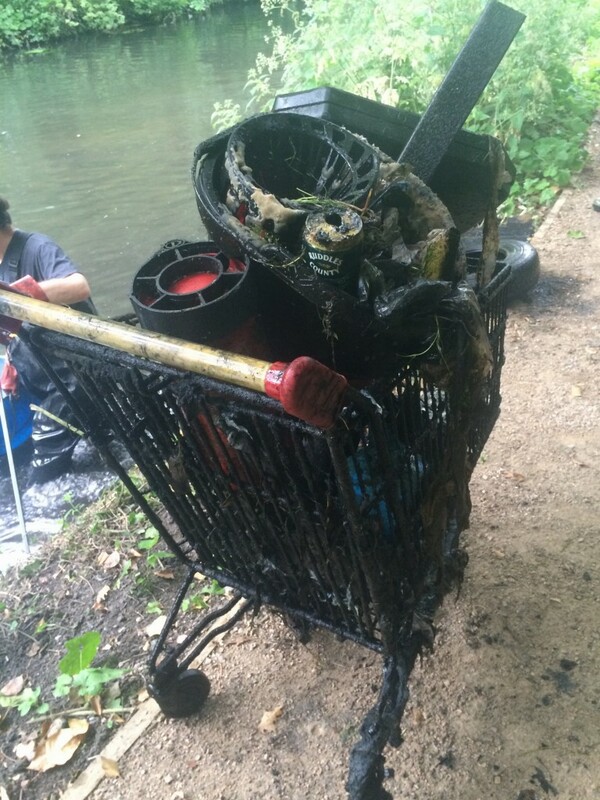 This entry was posted in Uncategorized and tagged Cleanups, Events, floating pennywort, Himalayan balsam, invasive species, Living Wandle Landscape Partnership, People, Pollution, South East Rivers Trust, Spreading the Wandle Word, Sutton, Volunteer, Wandle, Watermeads on June 22, 2015 by Polly. 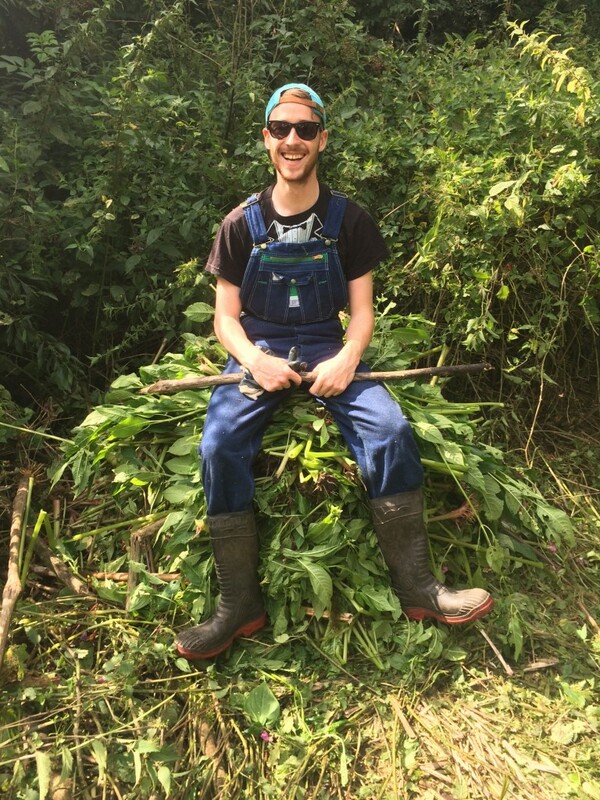 Welcome to our new Invasive Species Officer! 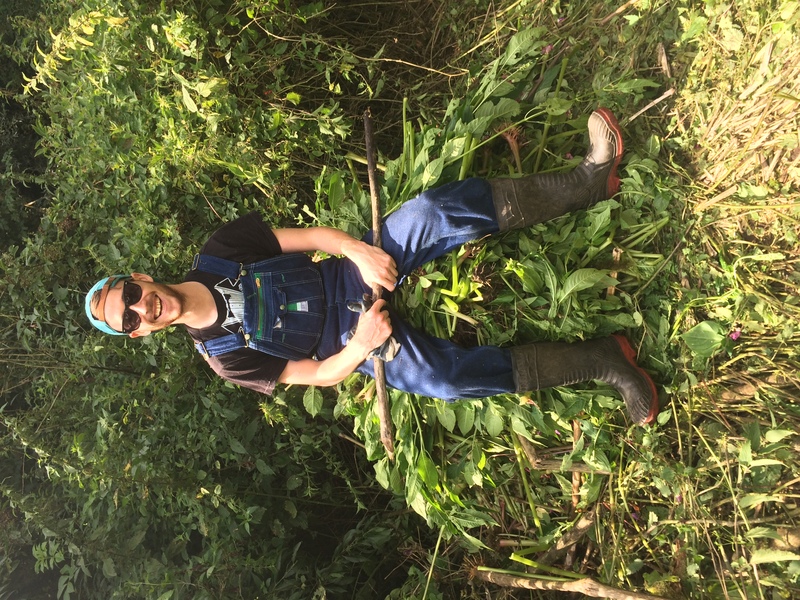 We’d like to give a warm welcome to our latest recruit Alan, our new Invasive Non-Native Species Officer! We’ve stolen Alan from Scotland where he was working on Argyll’s three National Nature Reserves for Scottish Natural Heritage. Before this Alan was in Cape Town, South Africa, controlling invasive species in the metropolitan area so he has a wealth of experience. 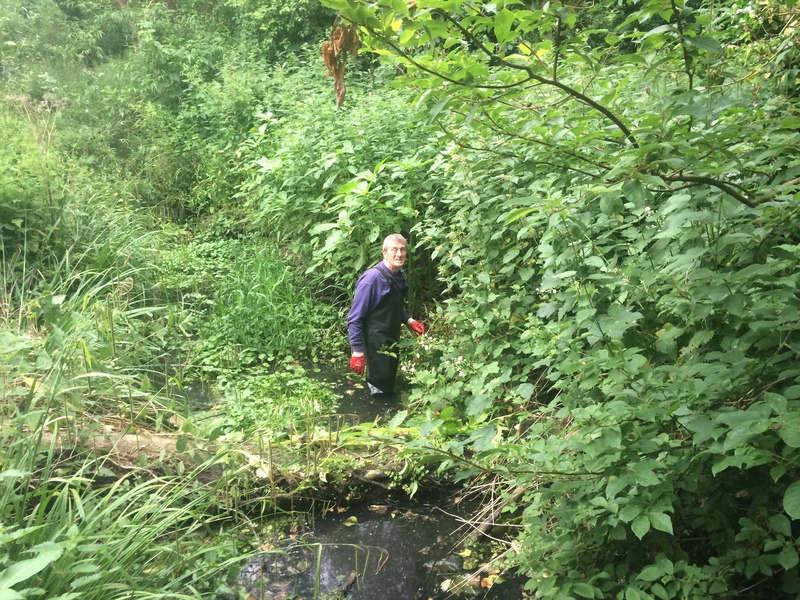 Alan is running an invasive species project on the River Wandle as part of the Living Wandle Landscape Partnership. 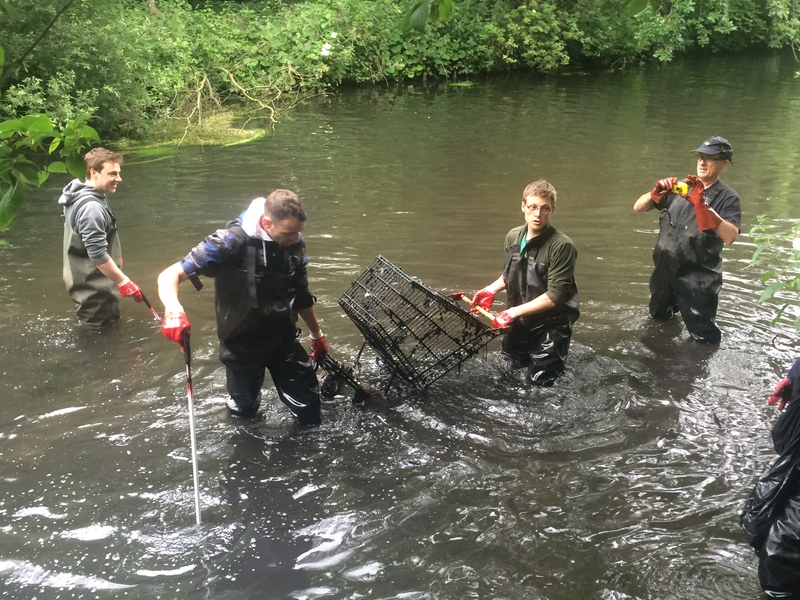 The project aims to map invasive species along the Wandle corridor and set up management plans and volunteer teams to work towards eradication. 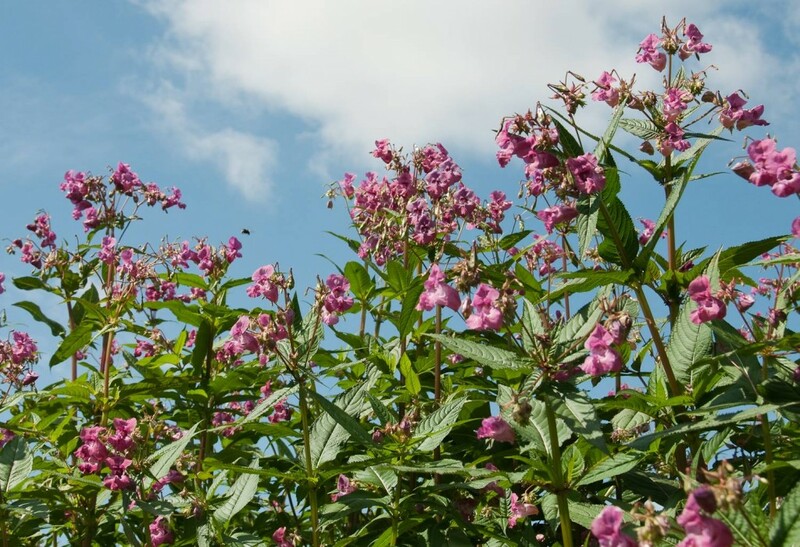 Alan will be tackling a wide variety of invasive non-native species including some well-known faces such as Himalayan balsam, Japanese knotweed and giant hogweed. So who you gonna call? This entry was posted in Wandle Catchment Plan and tagged invasive species, Living Wandle Landscape Partnership, People, Planning, South East Rivers Trust, Spreading the Wandle Word, Volunteer, Wandle, Welcome on April 28, 2015 by Polly. 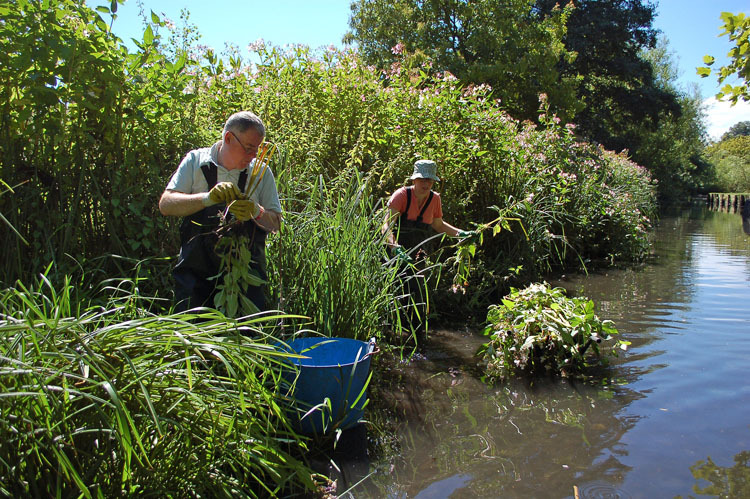 The Wandle Trust is recruiting a part-time Invasive Non-Native Species (INNS) Officer to help coordinate and deliver work to tackle aquatic INNS on the River Wandle. INNS can have a negative impact on rivers by both directly out-competing native species and indirectly altering habitats, for example by causing the excessive ingress of silt which can smother the natural gravel riverbed. 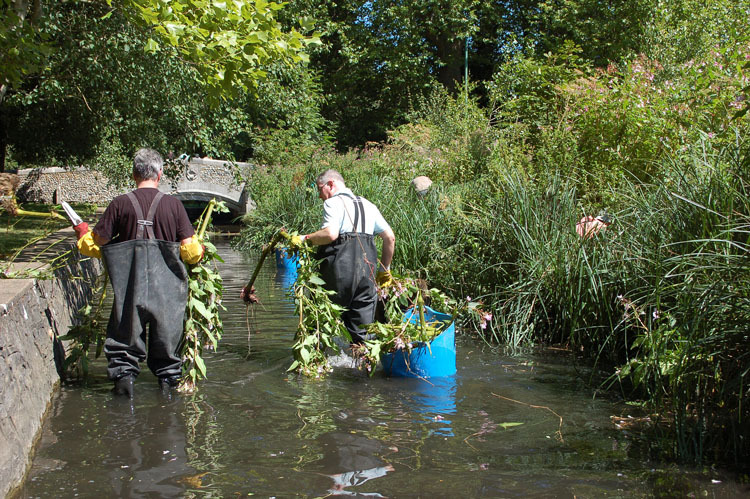 The post is supported by the National Lottery through the Heritage Lottery Fund and is part of the Living Wandle Landscape Partnership, a programme which involves the local community in the restoration and enhancement of the River Wandle landscape. 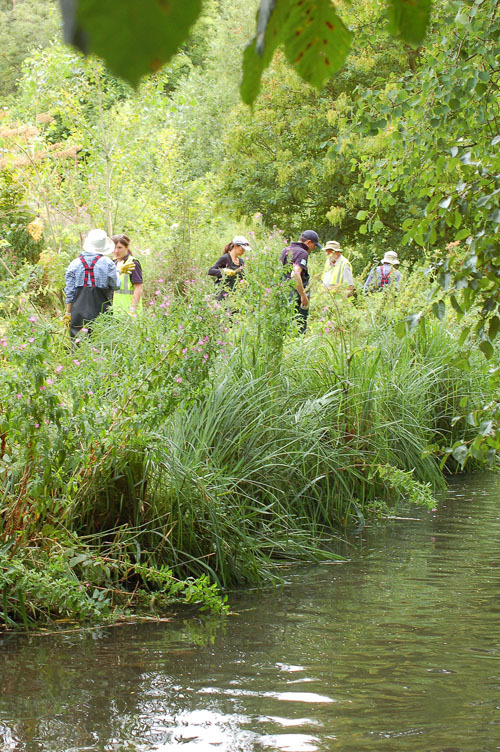 The Project Officer will be responsible for the day-to-day implementation of the River Wandle Invasive Non-Native Species Action Plan and Work Programme. The role will involve both coordinating the work of a range of partners and contributing to the delivery of the INNS Work Programme. This post is now closed. This entry was posted in Uncategorized and tagged INNS, invasive, invasive species, Jobs, Living Wandle Landscape Partnership, People, Wandle, Wandle Catchment Plan on December 19, 2014 by Bella.